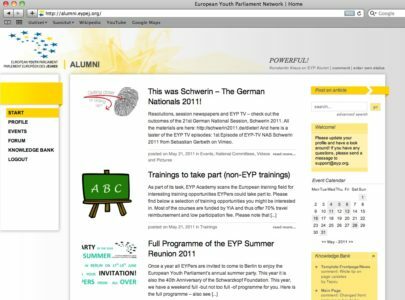 The new EYP Alumni Portal has been launched! EYP’s new online home is now open to EYPers from 35 (and more) countries around Europe! At the site you can find the most up-to-date information on all events, share and read EYP news, apply and register to events, connect with thousands of other EYPers as well as find materials in the Knowledge Bank. There will also be plenty of videos and newspapers from past sessions and you are warmly invited to share yours! Everything about EYP – in one place! All EYPers who had an existing account at the old platform (have registered for a session) should have received an email to the address that was in our database. If you have not received an email, you can send a short email to support@eyp.org and they will send you further instructions.